Ad Majorem dei Gloriam! : Chopsuey in the house! Yes! 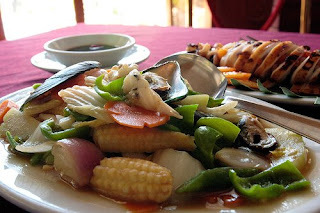 chopsuey in the the house, but not what you think off..no!no!no!.. its chopsuey, the vegetable food, many vegetable is present in this kind of dish, ofcourse it one of my favorite, I half vegetarian.(hahaha). Well, what make this dish great? among all things its because it has all my favorite vegetable. This is very simple way to cook, so easy and less time consumming! cook about 30 minutes. It's worth it and healthy to.Guyz!Guyz!Guyz! try it, Chopsuey in the house! In a big pan or wok, saute garlic, onions then add in the pork. chicken liver and gizzard. Add 1 cup of stock, pinch of salt and simmer for 15 minutes or until pork and chicken giblets are cooked. Mix in the shrimp then all the vegetables. Add the remaining 1 cup of stock, patis and the dissolved cornstarch. Cook for about 10 minutes or until the vegetables are done. Add the sesame oil.